Today I completed the visits to Ethiopiaid Ireland’s partners in Ethiopia: AWSAD, the Hamlin Fistula Hospital, Hope Enterprises and Cheshire Services opened their doors to Ethiopiaid and made us feel welcome every step of the way. Today I also read the United Nations Development Programme’s latest Human Development Report: 'Human Development for Everyone', which was released on March 21. The report shows that in almost every country, several groups face disadvantages that often overlap and reinforce each other, increasing vulnerability, widening the progress gap across generations, and making it harder to catch up as the world moves on. Principally women and girls, newborns and school-age children, rural dwellers, indigenous peoples, ethnic minorities, people with disabilities, migrants and refugees, and LGBT communities are among those systematically excluded by barriers that are not purely economic, but political, social and cultural as well. The Human Development Index measures the average achievements in a country in three basic dimensions of human development: a long and healthy life, education, and a decent standard of living. Ethiopia still ranks low at 174th out of 188: this means there are still many challenges the most vulnerable in the modern Ethiopian society face on a daily basis. AWSAD supports victims of gender-based violence and discrimination, harmful traditional practices and exploitation. The Hamlin Fistula Hospital is dedicated to the treatment and prevention of childbirth injuries called obstetric fistulas: a condition that can lead to severe infections and paralysis caused by nerve damage. Hope Enterprises operate two feeding programmes for people living on the streets of Addis Ababa and Dessie (both children and adults), seven elementary schools, five high schools, numerous vocational training and adult literacy programs throughout Ethiopia. Cheshire Services provide orthopaedic and social rehabilitation services for children and young people with disabilities also throughout Ethiopia. Salem (hello) and a smile were on every person I met. The testimonies we heard were heart-breaking to say the least. Nevertheless they thanked us infinitely for the support we provide, they know they now have the opportunity of a better life, an opportunity they never thought it was available to them and they will make the most of it. The people and the work I had the honour to witness are a sign of hope for all those who are mostly affected by the inequalities of the modern world and we are thankful for all the support of our donors, who through the provision of funding to our partners, are very much participative of the change we are enabling in the Ethiopian society. 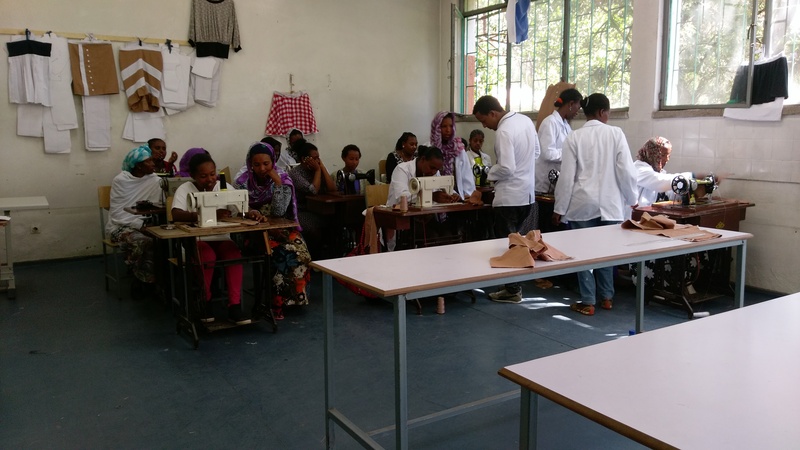 Eufemia, the team of Cheshire Services and visitors during visit at Menaghesa Centre / Tailoring Vocational Training for young mothers run by Hope Enterprises at Addis Ababa branch. This is the third of several posts Ethiopiaid will be sharing after each partner visit while in Ethiopia. 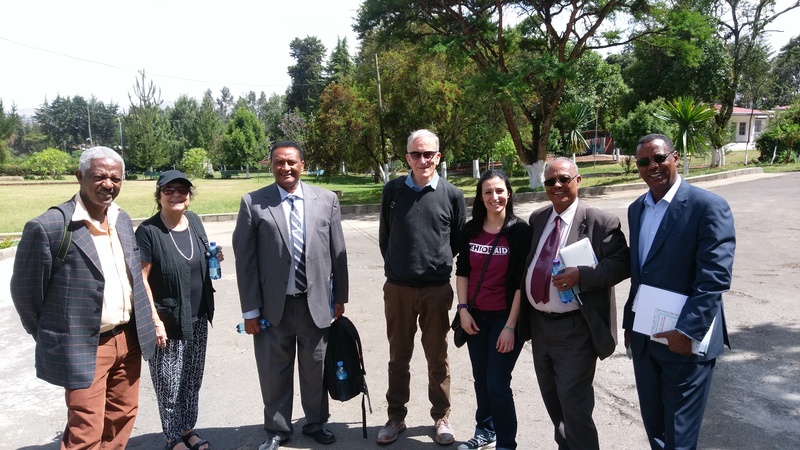 Every year, as part of our monitoring and evaluation process, the directors of Ethiopiaid Australia, Ethiopiaid Canada, Ethiopiaid Ireland and Ethiopiaid UK travel to Ethiopia to meet with our partners to make sure we are creating lasting and effective change and that your donations are well spent. Watch this space for more blog updates!